Vermont was once a global pioneer in the development of wind power. Today its failing to tap the enormous potential of this leading renewable-energy resource. Thats the expert opinion of David Blittersdorf, a Charlotte resident and the head of NRG Systems, one of the worlds leading suppliers of wind-measurement devices. The legislation was approved in the Vermont Senate by a 27-1 margin, with Republican Tom Bahre of Addison County casting the only nay. But the measure was beaten in the GOP-controlled House  primarily, says Blittersdorf, because of last-minute opposition from IBM. Big Blue claimed the bill would raise electricity rates that are already among the highest in the country. Backers of the bill vehemently disputed that allegation. Demo-crat Gerry Gossens, Addison Countys other state senator, says the renewable initiative would have had no immediate inflationary effect. He predicted Vermonters would save money in the long term as a result of decreased dependence on imported power and on what environmentalists regard as nonsustainable energy sources such as nuclear and fossil fuels. The environmental advantages of nonpolluting forms of power are both obvious and urgent for an overheating world. Progressive Vermonters may not like following the lead of the Lone Star State, but in terms of wind power, Texas is setting the national pace. Fearing the prospect of an oil bust later this century, blustery Texas has invested heavily in wind power to secure its energy-based economy. It brought more wind-generated megawatts on line last than any other state has to date. The United States lags far behind Japan and other countries in developing wind energy. In Denmark, the worlds number-one producer, wind power isnt seen as a politically correct fad; its a key component of the national energy strategy. All the more so as the country strives to meet the Kyoto Protocols requirements for reducing greenhouse gas emissions. The Bush administration, meanwhile, has refused to abide by Kyotos formulas for mitigating global warming. In most of the developed world, wind power isnt considered weird anymore. In fact, its now seen as the most viable form of renewable energy, apart from hydropower, thanks in part to an 80 percent drop in the cost of wind-generated electricity over the past 20 years. U.S. oil and gas companies are starting to invest in wind because they see it as the next big thing, Blittersdorf says. General Electric, too, has gotten involved, snapping up the wind-power division of Enron. Blittersdorf has outfitted his 3000-square-foot Dorset Street home with an array of solar panels and an 80-foot-tall windmill. The blades werent whirring at all one recent humid afternoon, but the silver structure usually generates enough electricity to meet much of his residential requirement, Blittersdorf says. On especially windy days, the blades spin so furiously that his windmill produces surplus power that gets blown back into the utility grid. His electric meter actually spins backward on those occasions. But raising the windmill was mainly a symbolic gesture on Blittersdorfs part. The cost of small wind  the term for such single-customer units  remains substantial for residential customers, at $35,000 or more. Realizing any financial savings from such an investment can take decades. Getting permits to erect the tower was also a hassle. One of Blittersdorfs neighbors fought it on aesthetic grounds, which protracted the process. Blittersdorf finally agreed to cap the windmill 20 feet below a much more effective height for capturing the winds. Opposition to the purported unsightliness of windmills is a major impediment to development of this energy resource in Vermont and elsewhere. In Burlington, for example, objections to siting a demonstration-project windmill on the downtown waterfront delayed its startup and ultimately caused it to be situated in a less conspicuous location  on Burlington Electric Department property along Pine Street. Republican State Senator Vincent Illuzzi has had to contend with complaints about his plan to build a 96-foot-tall windmill on a ridge in Derby overlooking Lake Memphrem-agog. A Public Service Board hearing officer ruled last month, however, that the tower would not unduly blemish local views. Despite receiving little statewide publicity, the legislation to promote renewable energy sparked considerable interest among Vermonters. Gossens says he received more constituent mail on that bill than on any other in the past session. He attributes the concern more to a widely shared green ethic than to a naive assumption among Vermonters that they will be able to build windmills in their own backyards. Vermonts population is much more in tune with renewables than elected officials are, says Coleman. But he is quick to credit Sen. Jim Jeffords for career-long advocacy of wind power and notes Sen. Patrick Leahy has also been supportive. The promotion of renewable energy ranks as a new cause for Representative Bernie Sanders, according to Coleman. Northern Power Systems, like Blittersdorfs NRG, does most of its business with out-of-state  indeed, out-of-country  firms. Both are among Vermonts biggest entrepreneurial success stories, although the state accounts for only a tiny fraction of each companys sales. Northern Power Systems now employs 90 people, roughly three times as many as a decade ago when Coleman took over as president after a dozen years of service with the company. Its that payroll expansion, along with productive use of loans from the federal Small Business Admin-istration, that has made his firm an SBA poster child, according to Coleman, and earned him the small-business award. Northern Power Systems can best be described as an integrator or packager of wind-energy components, according to its president. Much of the companys work is done in remote Latin American and Alaskan villages that are unconnected to utility grids. 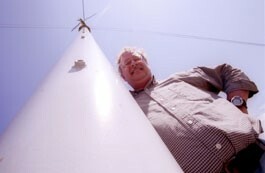 Northern Power also focuses on research and development of wind turbines, with one innovative design now being used to generate electricity from atop the Rock of Ages quarry in Barre. Vermonts only commercial wind farm is in Searsburg. Green Mountain Power built a set of turbines there in 1997, at a cost of $11 million, that is able to generate a maximum of six megawatts of electricity. A subsidiary of Central Vermont Public Service Corp. is meanwhile working with Endless Energy, a Maine-based company, to develop a major wind project atop Little Equinox Mountain in Manchester. The Burlington Electric Department has already agreed to buy a sizable share of the power produced by the proposed plant. The involvement of Central Vermont Public Service recalls the utilitys role 60 years ago as sponsor of what was then the worlds largest wind-power facility. It stood atop Grandpas Knob in Castleton and was in service from 1941 until 1945, when a rotor blade broke off, apparently due to metal fatigue. The project was subsequently abandoned. Some Vermont ski areas are considering adding windmills to their mountaintops. The potential benefits are significant, since energy represents one of the biggest expenses for an industry that has not fared well in recent years. Use of wind power could prove quite practical, experts say, since wind velocity on Green Mountain summits is often highest on winter nights  precisely when snowmaking machines are often in full operation. Timing is everything with wind power. No electricity can be generated when winds are calm, and designers still have not solved the problem of how to efficiently store power generated when the wind is blowing strongly. Thats the sort of language that Republicans, particularly, should be able to understand  even in Vermont.